On life with Pearl: Having a dog brings so much more to a family than I'd expected. I grew up with dogs but Pearl is the first dog I've been responsible for. She's a great reason to go out and a lovely companion to stay in with. She has bought bundles of fun but in turn has a massively calming influence. Our girls and their friends absolutely adore her too! 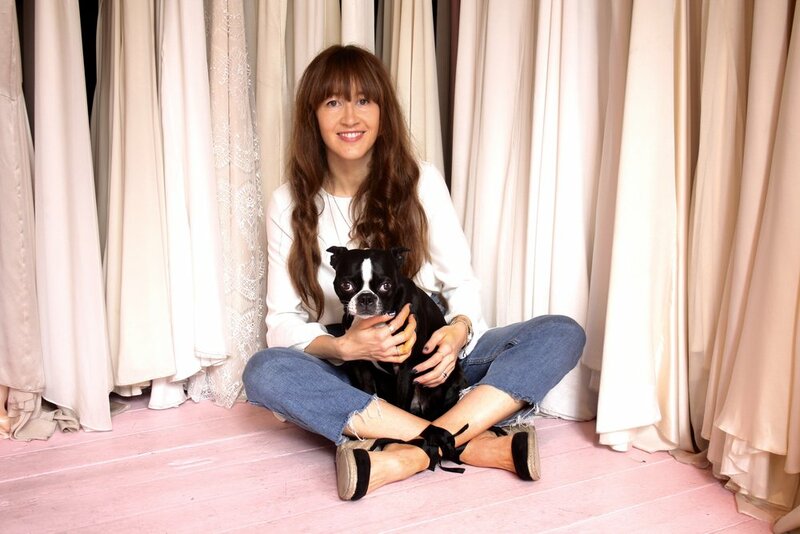 On work: I am one of the creative directors behind Belle & Bunty - a womenswear bridal label and style blog, along with my business partner Hannah. We started Belle & Bunty about 12 years ago. No two days are ever the same and I think that diversity is why we love it. 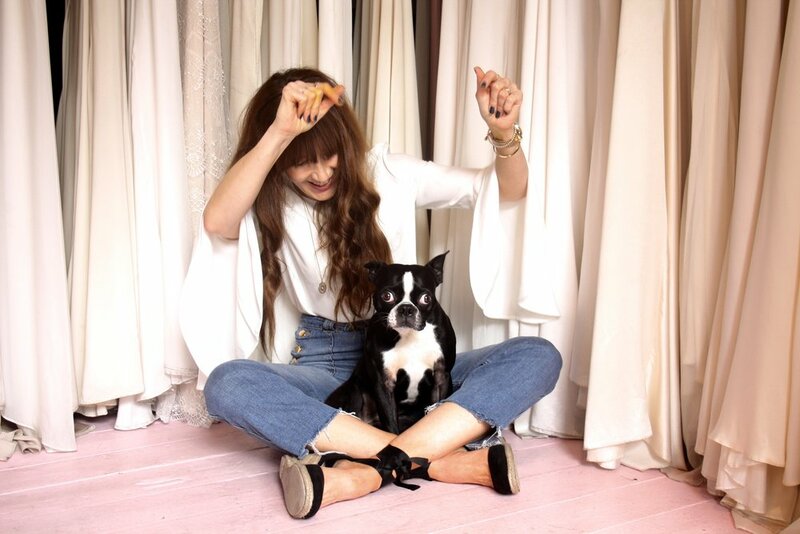 We both trained at the London College of Fashion and started as a ready-to-wear label. We branched into bridal about seven years ago now. The blog has grown organically alongside the rest of the business. It's great that there are two of us to divide and conquer and we can swap hats between the different arms of our label. Having said that, the diversity of what we do can often be what we struggle with. Feeling like you're on top of things can always be closely followed by that feeling that you're most definitely not! On juggling everything: I try and keep my working hours 9-5.30 when the girls are at school. I'm very lucky to have family close by that help out a lot and a bunch of lovely friends that take either the girls or Pearl under their wings when things get a little chaotic. I think for all working mums it's a case of constantly switching hats (and shoes for that matter!). Trying to be in the moment and focusing on the job in hand is sometimes easier said than done. On her daily routine: I let Pearl out in the morning and send her upstairs to wake up the girls which she does with great vigour and enthusiasm. Once the school run is done, Pearl and I head to Hampstead Heath for a brisk walk up Parliament Hill which is a lovely way to start the day come rain or shine. She'll often come with me to the design studio or the sample rooms where we make our dresses and she gets spoilt rotten with cuddles. At the boutique she mostly sleeps out the back but she always pops out to say hello to any brides. Brides can often be quite anxious so it can be really nice to have a dog around to take away the formality of the situation. She's a very easy companion, pretty happy and well behaved wherever we end up. She occasionally makes an appearance in our Instagram shoots as well. On career advice: The fashion industry has massively changed in the 13 years we've had our label, from being quite a 'closed door' industry with a distinct 'you're IN or you're OUT' policy. With social media, small brands can be transformed over night because they have the power to tell their own marketing story. My advise would be to get your brand identity strong and use social media to your advantage. We studied womenswear design, pattern cutting, embroidery and print at the London College of Fashion which was obviously essential to our clothing brand, but it has also really informed our blog. Those hands-on skills are really at the heart of good brands and you can tell in the dedication to the craftsmanship and quality. Get a good rounded fashion education! Be a nice, conscious person. Manners cost nothing and in an industry that can be renowned for its divas and its frivolousness there are an army of people creating great garments and content that is well thought out, informed and socially aware. On the best piece of fashion advice she's been given, and the best for brides: Be yourself. I believe in this completely. Your wedding dress should sit comfortably with who you are and not be a disguise for who you think you should be. On her favourite Pearl 'tail': She has real maternal instincts towards our girls. She will sit on their beds until they fall asleep and I'll catch her checking on them through the evening. She also didn't make it through her 6 week puppy training school because she was a bit of a hell raiser - which appeals to my naughtier side! On one thing people should know about her: I used to do extra work on films while I was studying at the London College of Fashion. My best job was in Starwars episode three: Revenge of the Sith, as the character Delva Racine. I even have my own Wookieepedia page!